DOUBLE READOUT PLAN MEASURE Ideal for blueprints, map scaling, and drawing. 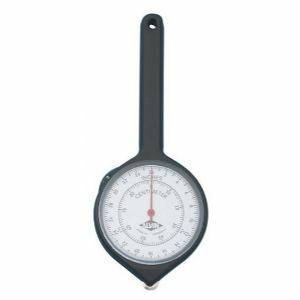 Determines distances in miles or kilometers on maps and plans according to scales indicated on dial. Assures precision measurement forward or backward and follows curved lines. Precision metal gears are reset by revolution counter. Convenient handle for easy maneuverability. Two large, easy-to-read dials with unbreakable plastic faces. White dial graduated in inches and centimeters (36" = 92cm). Yellow dial graduated in ½", ¼", 1/8", and 1/16" to the foot. Includes leather-like vinyl pouch for protection.